This second, thoroughly revised, updated and enlarged edition provides a straightforward introduction to spectroscopy, showing what it can do and how it does it, together with a clear, integrated and objective account of the wealth of information that may be derived from spectra. It also features new chapters on spectroscopy in nano-dimensions, nano-optics, and polymer analysis. Clearly structured into sixteen sections, it covers everything from spectroscopy in nanodimensions to medicinal applications, spanning a wide range of the electromagnetic spectrum and the physical processes involved, from nuclear phenomena to molecular rotation processes. In addition, data tables provide a comparison of different methods in a standardized form, allowing readers to save valuable time in the decision process by avoiding wrong turns, and also help in selecting the instrumentation and performing the experiments. These four volumes are a must-have companion for daily use in every lab. Professor Gauglitz published over 225 publications on photokinetics, UV-VIS spectroscopy, chromatographic detection, optical sensors, modification and characterization of boundary layers, and many more topics. He is author of several books on practical spectroscopy, and basics and applications in photokinetics, among others. Professor Moore published more than 110 publications and five book chapters, as well as holder of four patents. He is presently a technical staff member at Los Alamos National Laboratory, USA. David Moore received a B.S. in Chemistry (University of Utah, 1974) and a Ph.D. in Physical Chemistry (University of Wisconsin, 1980). He was a Los Alamos National Laboratory Director-Funded Postdoctoral Fellow (1980-1981) and an Alexander von Humboldt Fellow (Essen 1993-94). in 2004 he was named Fellow of the American Physical Society. This completely revised and updated edition of the standard reference work on spectroscopy now contains new chapters on spectroscopy in nano dimensions, quality control, spectroscopy at surfaces, polymer analysis and nano-opitcs. "...the value of the work as a real encyclopedia on analytical spectroscopy, which will find appreciation both by practitioners as well as by researchers in the field." "...very comprehensive treatment of spectroscopy...highly recommended..."
"In general, I think this book will serve as an essential spectroscopy "encyclopedia" for experimentalists active in the field of spectroscopy or those who are planning to enter this area in an industrial as well as a university setting." "...collections that seek comprehensiveness in spectroscopy, will find this a collection of practical and generally well-written articles on analytical techniques of spectroscopy." "To sum up, this two-volume handbook provides comprehensive coverage on a variety of modern spectroscopic techniques... This is a suitable reference book for any practitioner in spectroscopic analysis, and we would recommend it for any scientific library." 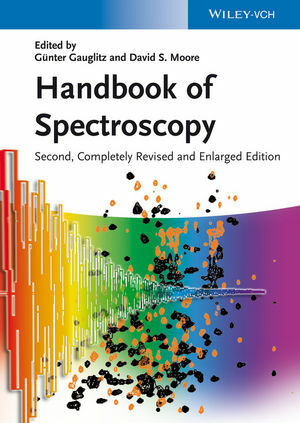 "...I am pleased to recommend the "Handbook of Spectroscopy "as an up-to-date, authoritative, comprehensive reference source providing rapid access to essential information for a wide audience involved in the research, teaching, learning, and practice of spectroscopic technologies both to newcomers as well as to advanced practitioners of the field and to academic, industrial, and technical libraries." "Research scientists, analytical scientists, environmental investigators, and industrial engineers, who are often confronted with the ever-increasing complexity of real-life sample analysis, will find a readily accessible source of information and authoritative guidance on how to best apply currently available spectroscopic techniques to their particular fields of interest and to their specific applications."